If you’ve already been to Florence, you might have noticed that right in front of the Duomo stands another landmark, the Florence Baptistery. Looking at this landmark, you might have noticed the presence of three bronze doors on the North, East and South sides. These doors, known as ‘The Gates of Paradise’, encompass the beauty of the construction. Their fame stems not only from their uncontested beauty, but also because of the stories and experiences behind their realization. 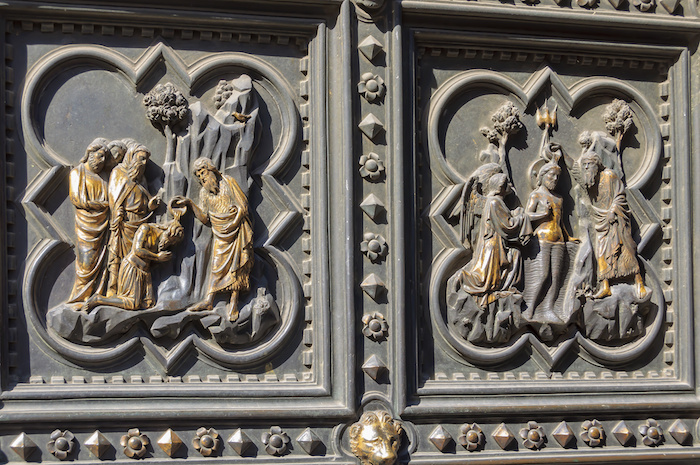 In this guide, learn all about the Gates of Paradise and the other Florence Baptistry doors. Want to see the Florence Baptistry up close? We recommend seeing this grandiose work of art and architecture on a guided tour. 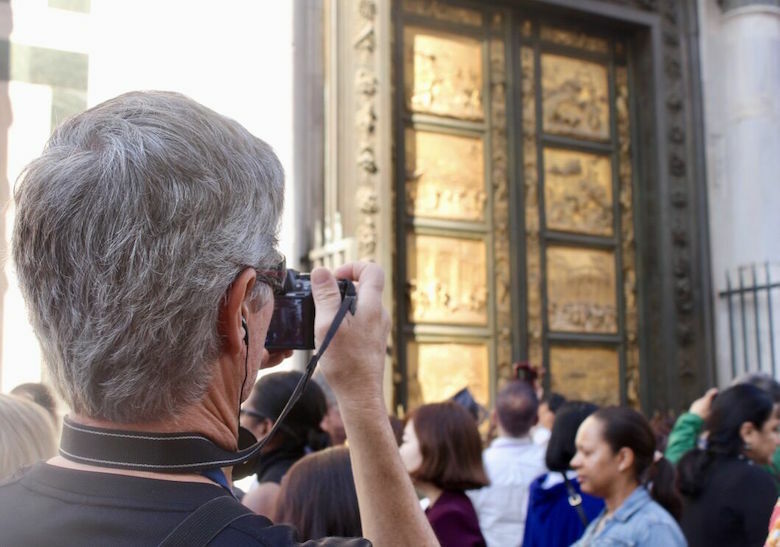 Check out our Half Day Florence Walking Tour or Florence Full Day Tour to see Ghiberti’s Gates of Paradise with an expert guide. Want more Florence? 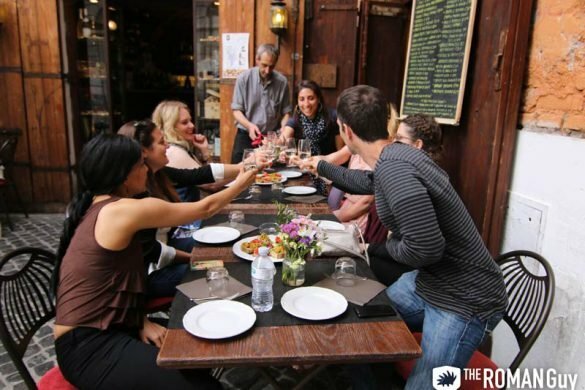 Check out the rest of our incredible Florence tours. The East Door drew its inspiration from the Old Testament. 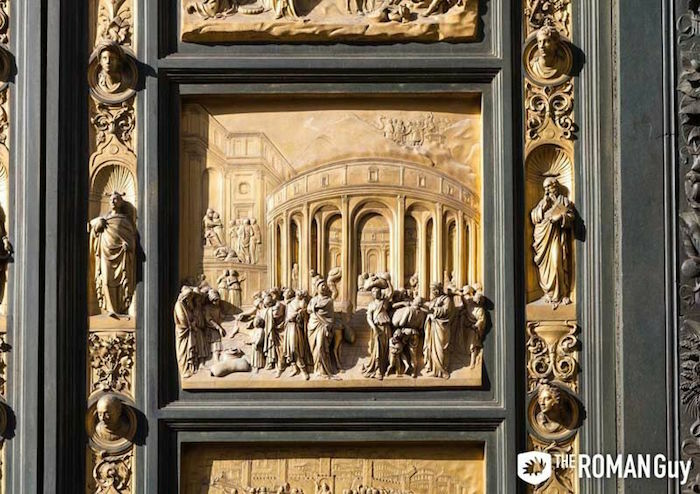 According to the famous Italian historian and architect, Giorgio Vasari, it was Michelangelo who named this door as “Heaven’s Door” after having seen it for the first time. This art masterpiece was constructed by Lorenzo Ghiberti, who worked on this portion of the Baptistery doors from 1425 until 1452. What we could admire today is a copy of the original panels that were removed after the tragic Florence alluvion in 1966. The original work is actually showcased at the Museum dell’Opera del Duomo. In 1424, Ghiberti was directly entrusted by the Florence jury with the decoration of the door without having to concur with other artists. 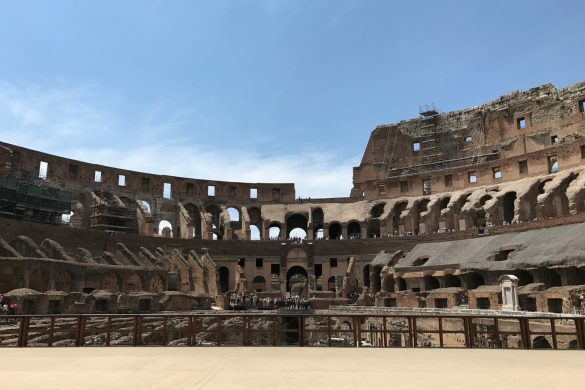 Also, the jury decided to grant to the artist a total interpretative freedom as long as he would have portrayed some of the stories from the Ancient Testament selected by the fine historian Leonardo Bruni. The main theme chosen by Ghiberti is the Salvation. By carefully organizing the panel dispositions, he wanted to remind to the spectator the importance of God’s sacrifice and to create a raising emotional journey. What does the East Door Depict? The first two panels above show Adam and Eve and Cain and Abel. In the other panels below some characters from the Old Testament such as Noah, Joseph and Abram are displayed. What the spectator can experience by observing these panels in sequence, is a raising sense of drama and, at the same time, the salvational power of God. Also, this door is one of the first examples of the use of modern perspective in art. Ghiberti spent the last years of his life working on these panels. During the last period of decoration, he was helped by some of the most influential Renaissance artists such as Donatello, Michelozzo and Cennini. Who Created the South Door’s Panels? The city of Florence searched for a long time, looking for the perfect artist to decorate this door. The first artisan entrusted with the work was Piero di Jacopo, but the final result seemed disappointing and the organization decided not to display these panels. Instead, they chose to keep looking for another artist. In 1329, Florence chose Andrea Pisano who worked on the project until 1336. 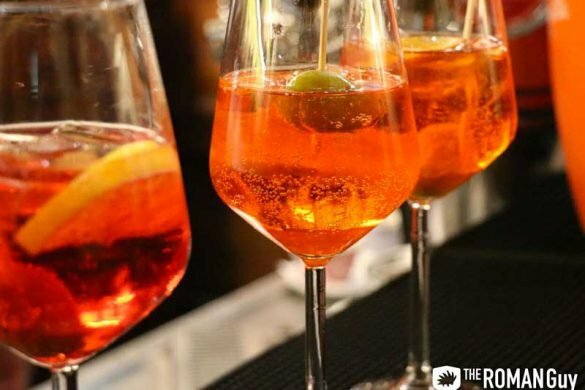 It took more than a whole year for the Florentine organization to believe in Pisano’s potential. He was studied by the jury for a long time and he had to pass several exams, as we could say today, such as architectural drawing and panels decorating. 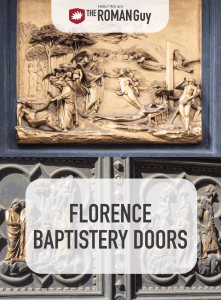 What do the Florence Baptistry’s South Doors Depict? Pisano decided to decorate the first 20 panels with the most important episodes from the life of John the Baptist, dedicating the South Door of the Florence Baptistry to the history of John the Baptist. For the remaining 8 panels, Pisano decided to reproduce the four theological virtues and the four human virtues. The final message brought by these panels is the eternal contrast between life (left panels) and death (right panels). To find the real peculiarity of these panels, we have to observe their style. In fact, they seem to have a gothic influence which can prove how Florence was already exchanging and absorbing ideas from other countries. These panels are the proof that, despite the absence of papers or internet, ideas and styles were constantly exchanged in Europe. Sixty-five years after Pisano’s South Door, the Florence administration decided to induce a public contest in order to find an artist able to decorate the North Door. Among other names, those of Lorenzo Ghiberti and Filippo Brunelleschi appeared. There are still many rumors around the actual winner of the contest. Ghiberti affirms in his autobiography that he was the only winner, while other sources mention a tie between the two artists. Despite the rumors tough, the Florentine administration entrusted Ghiberti with the decoration of the doors and his work started in 1402. The artist promised the jury that he would work alone, helped only by his father and produce three panels every year. The jury, in response, signed with the artist a contract where they committed to pay 200 fiorins per year to Ghiberti and his father. What do the Gates of Paradise Depict? In the decorated panels, the artist portrayed all the stories from the New Testament: from the Annunciation to the Pentecost. It’s necessary to read the panels starting from those below and to proceed until the top. 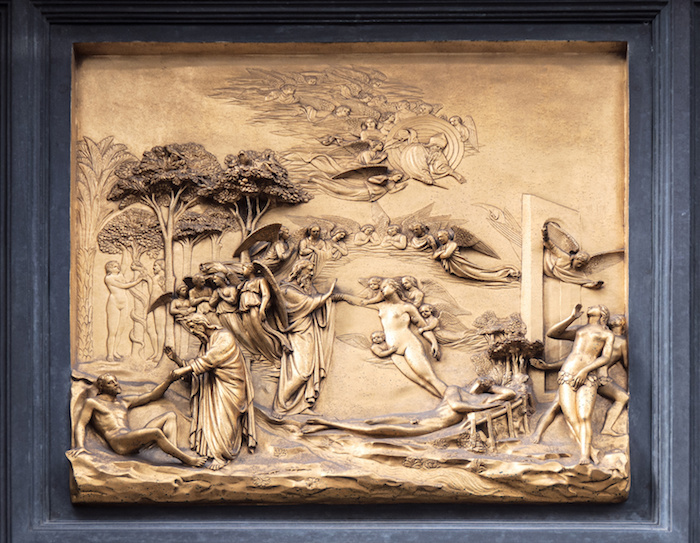 Ghiberti chose this disposition to underline the sense of tragedy in the Christ Passion. Also, in the 26th panel, it’s possible to observe Ghiberti’s self-portrait, probably the first self-portrait executed during the Renaissance. Every panel is finely decorated and fulfilled with details, such as plants and landmarks. Ghiberti was one of the first artists to show a deep interest not only in the main characters of the scene, but also in the background. The Gates of Paradise are unique because of this very minor detail. 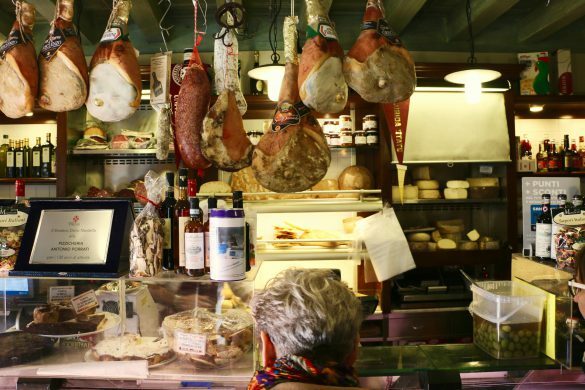 Florence carefully preserves The Gates of Paradise, a masterpiece from the Renaissance. Many people worldwide enjoy their beauty and evocative power. Italian traveler and museum geek. I'm currently living in Paris after having finished my studies in Italy. Art is my passion as much as a good carbonara pasta plate.